The San Diego Blood Bank has opened a new Carmel Valley Donor Center in the Piazza Carmel shopping center, 3880 Valley Centre Dr., Ste 209 (in the middle of the center, behind the food court.) A Grand Opening celebration is scheduled on Friday, April 19 at 11 a.m. The hours for the new Carmel Valley Donor Center are: Friday to Monday from 8:00 AM – 4:00 PM; and Tuesday from 10:00 AM – 6:00 PM. Anyone 17 or older, who weighs at least 110 pounds and is in good health may be eligible to donate blood. A good meal and plenty of fluids are recommended prior to donation. For more information or to make an appointment to give blood, please call 1-800-4MY-SDBB (1-800-469-7322) or visit sandiegobloodbank.org. Just in time for spring break, there are two local parks with new play equipment ("tot-lots") that should be opening this Friday, April 5, 2013: Carmel Grove Park, located at the corner of Carmel Creek Road and Carmel Grove Road (just behind Piazza Carmel), and Del Mar Trails Park, located on Del Mar Trails Road between Mona Lisa and Mercurio. On the other hand, the Winwood Park playground, located on Carmel Creek Road just south of Carmel Creek Elementary, will close on April 8 for a renovation that should complete late this summer. So, we gain two brand new playgrounds but lose one for a while. The race for the CV Planning Board seat for Neighborhood 5, pictured here, features the incumbent Debbie Lokanc running against newcommer and One Paseo supporter Elissa Krasenbaum. This neighborhood is the residential area bounded by Carmel Creek Road, Carmel Country Road and SR-56 (the area around Carmel Del Mar Elementary School.) I don't personally like One Paseo, so I would recommend voting for the Incumbent, Debbie Lokanc. The election is Thursday, March 28, 2013 from 5:00 to 5:30 PM at the CV Library, 3919 Townsgate Drive. Note: Only residents of the neighborhood may vote, bring proof of residency (driver's licence, utility bill, etc.) Multiple residents from the same address may vote, as long as you're 18 or older. There are two new restaurants opening in the area: Royal India has replaced the old Star of India in Piazza Carmel (Click here for the story, & click here for the restaurant website), and Snooze Del Mar will be replacing the iHop in the Town Center (Click here for the story, restaurant website not yet available.) 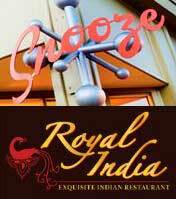 You'll know Royal India from their downtown location, and Snooze has another branch in Hillcrest. The Carmel Valley Community Planning Board (CVCPB) has set Thursday, March 28, 2013 for its annual Board member election. Carmel Valley and Pacific Highlands Ranch (PHR) residents are being encouraged to run for one of eight seats up for election on the Planning Board. The CVCPB is a group of elected volunteers who meet monthly to review and to evaluate proposed development plans and issues affecting the entire Carmel Valley and Pacific Highlands Ranch communities. Serving in an advisory capacity, the CVCPB offers specific comments, recommendations and decisions to the City of San Diego’s Department of City Planning & Community Investment, Plarming Commission and City Council. The CVCPB has direct involvement with city, county and law enforcement agencies. The following seats are up for election on the Carmel Valley Planning Board: Residential seats for Neighborhoods 1, 3, 5, 6, and 10; 1 Business Seat; 1 Investor Seat; the PHR Residential District 11 seat, and 1 Developer seat (appointed by the Chair). The election will be immediately prior to the March board meeting, Thursday, March 28, 2013 at the Carmel Valley Library. Here's you're chance to participate in the local community! Find the CV Planning Board Neighborhood Maps Here. Residential seats are for people who are at least 18 years old, currently living in Carmel Valley or PHR, and reside in the seat’s district. In order to be an eligible candidate in the March election, the candidate must declare his or her intention to run for the seat and submit an application. Candidates for residential seats must have attended two complete meetings of the CVCPB’s last 12 regular meetings prior to the March election. Carmel Valley Farmers Market? It's Back! I've heard that the Carmel Valley Farmers Market is coming back with a new operator, starting Feb 28, 2013! The location is still the same, out at the east end of Del Mar Heights Road in the Canyon Crest Academy (CCA) parking lot (5951 Village Center Loop Road), with the marketing opening at 3:30 pm. And the proceeds will still benefit the CCA Foundation, so you'll continue to help fund programs while you shop. There are rumors of live music and a different selection of vendors... More information coming soon, I assume there will be a new website, facebook page, etc. Read more about Carmel Valley Farmers Market? It's Back! Help Seniors & Become a Volunteer Driver! There will be a FREE workshop for the JFS "On the Go 101" program at the Carmel Valley Library, 3919 Townsgate Dr., on Wednesday, March 13, 2013 from 6:30 – 7:30pm. The program provides rides for seniors. Can you imagine how it feels when you need to get somewhere but can’t because you no longer drive? Many older adults live with the loss of independence every day. Without transportation, simple things such as medical appointments, grocery shopping or a lunch date become major life challenges. You can make a difference! Become a part of On the Go’s transportation solution by joining our Rides & Smiles® Program as a Volunteer Driver. Benefits of Volunteering: Volunteers choose who, when and where they drive, using our convenient web-based scheduling system; Mileage reimbursement; Secondary auto insurance; and Knowing you made a difference in the quality of life of an older adult! Read more about Help Seniors & Become a Volunteer Driver!